Another slow cooker dinner recipe! 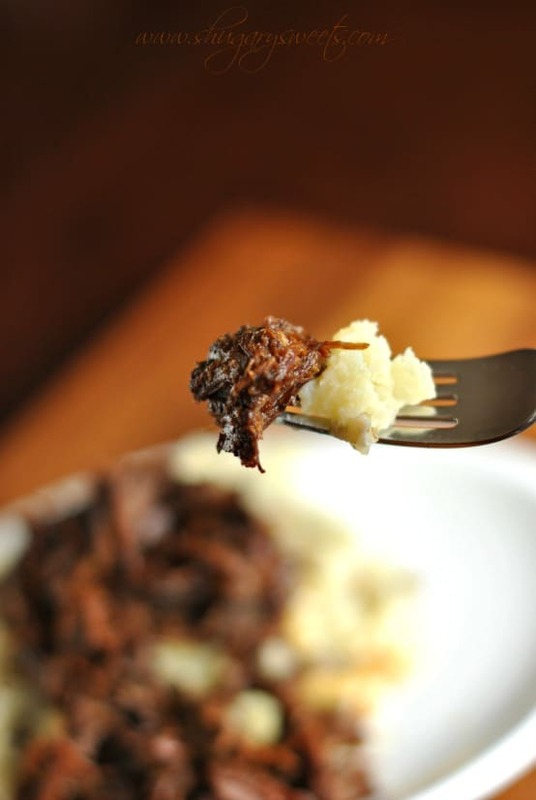 Balsamic Shredded Beef is perfect when you crave comfort food but don’t want to turn on the oven! I think I’ve mentioned it once or twice that I love my Slow Cooker! We seriously use it for dinner recipes 3-4 times a week. With after school activities as well as homework, the dinner hour can be quite hectic! It’s funny though. I remember having babies in the house and thinking the dinner hour was hectic. I guess you always think the grass is greener! Life is certainly much busier now that the kids are older. Not to say it wasn’t crazy back in the day, it was just a different crazy. An exhausting, running after toddlers and feeding babies kind of crazy. So this slow cooker thing? It’s been a part of my life for many many years! Ironically enough, I still use the same slow cooker I got as a wedding present, almost 18 years ago! It’s ugly as heck, but it works just great. Let’s get back to this beef though. I used a 5 lb roast, you can certainly use a smaller roast and scale back the ingredients for the sauce if you’d like. Or, keep the sauce the same and have a nice gravy to put over potatoes! Better yet…make the big roast and freeze half of it after cooking so you have a second dinner ready to go in your freezer! Balsamic is one of those ingredients I never really cooked with much in the past. Then a couple years ago I made THIS balsamic pork tenderloin. My life was changed. These two dinners are now on my favorites list and get rotated into our menu once a month! I hope you rotate them into your dinner menu soon! Whisk together all the ingredients and add to the bottom of a slow cooker. Add roast. Covere and cook on low for 6-8 hours. Remove roast and shred with a fork, return to juices. Serve and enjoy. The gravy is delicious with mashed potatoes too! 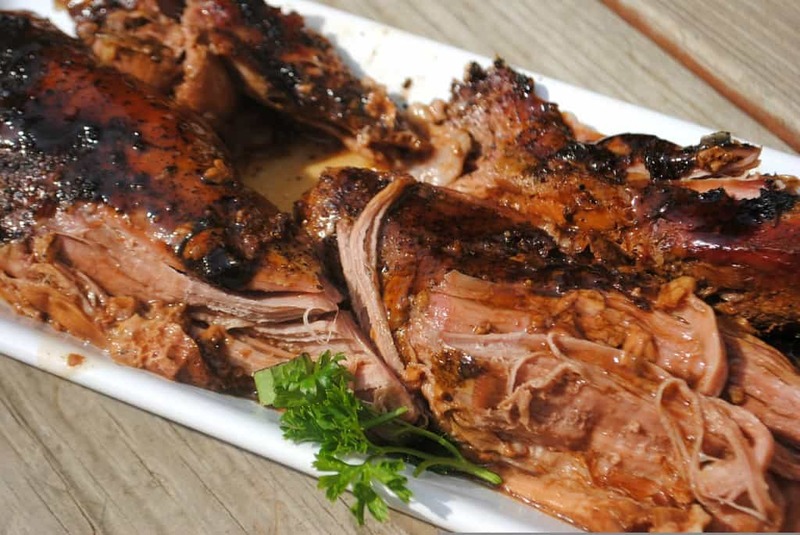 Balsamic Glazed Pork Tenderloin is one my favorite meals! 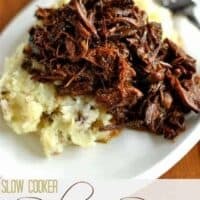 Made in the slow cooker, it’s easy and delicious! Perfectly paired with marinated cherry tomato salad, too. 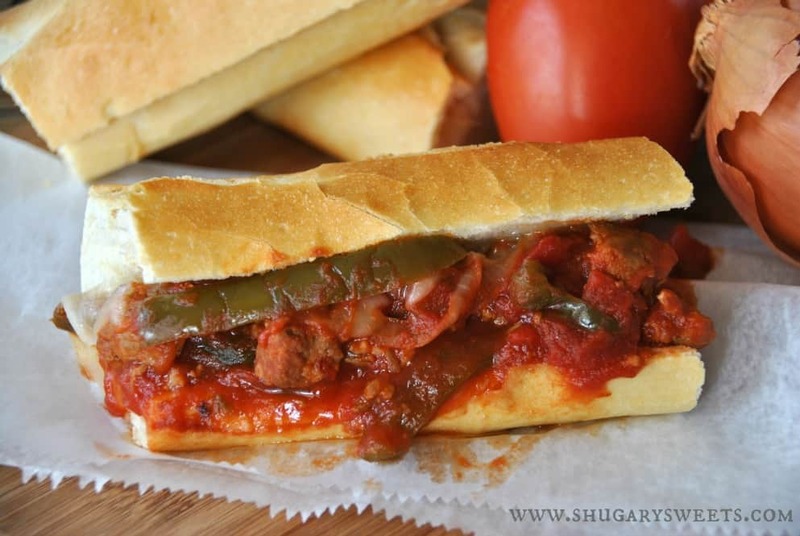 Slow Cooker Sausage and Peppers is a delicious meal to make for a crowd! Have some nice, crusty rolls to serve it on, or a rice would be delicious too. Want a two-for-one deal? Make dinner once by cooking up a big roast in your slow cooker. 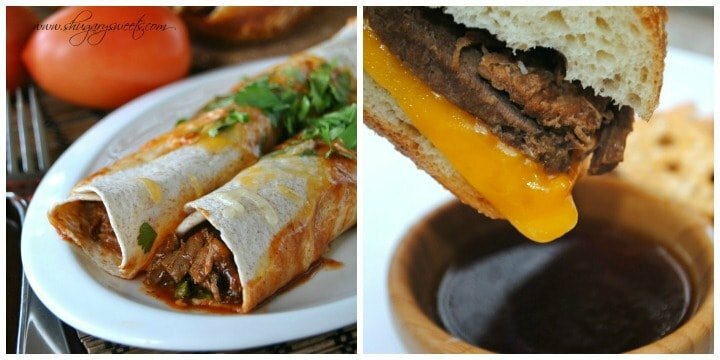 Use the meat to make Beef Enchiladas one night and French Dip Sandwiches another night! This looks awesome! We need to use our slow cooker more, and I don’t cook nearly enough with balsamic vinegar. I want to pick a roast at the store this weekend and try your recipe next week! Let me know if you try it Eva! I remember thinking: when she gets to Kinder, life will be easier and slower. I love your slow cooker meals, and my family is going to love this one! I know it. We always think the next phase will be easier!! enjoy the recipe Dorothy! This looks amazing, Aimee! I love shredded beef and pork in the slow cooker. I wish I had some right now! This looks fantastic! I love using my slow cooker, especially when I have to work and don’t want to make dinner when I get home. Definitely need to give this recipe a try! Thanks Elaine! My slow cooker is definitely overused, but I love the convenience! This looks mouth watering! YUMMY! I agree life does seem a whole lot busier now. Now I wish I hadn’t been so eager to get past the busy baby stage 🙂 All your crock pot recipes have me inspired to pull out mine for this summer. Oh my goodness, this looks SO mouthwatering, Aimee! Definitely a must-make for me. We should all remember to use our CrockPots this time of year! This recipe has my taste buds going crazy! Balsamic with spy sauce and brown sugar sounds amazing! It would pair so well with beef. I love slow cooker meals too — I’m so pinning this! Oh. My. Lard. This looks INCREDIBLE! Can you come make dinner at my house? I love juicy and tender shredded beef! And I love the crockpot and how little effort it requires! I have followed one of your recipes making the pork tenderloin in the crock pot and it is super delicious and definitely makes me want to use my crock pot more! Glad you enjoyed the recipe! I love using my crock pot!! Your a genius! Balsamic! Yumm, I must try this recipe soon. I love my slow cooker too! I’m always looking for new recipes, thanks so much! I am always looking for delicious crock pot recipes. They are definitely a life saver for a busy family! This looks like a winner! oh. my. goodness. THat looks so juicy!! We love balsamic in my house, this beef is sounds so good! Lots of great flavor, and dinner waiting for you is always good! I love having dinner waiting, that’s the best part!! It’s amazing how long slow cookers can last (Or kitchen stuff in general!). My parents just got a new one and they’ve been married 25 years. I LOVE balsamic. I’m going ot pass this on to my parents! Our slow cookies is almost as old, and probably as nasty, but it works! 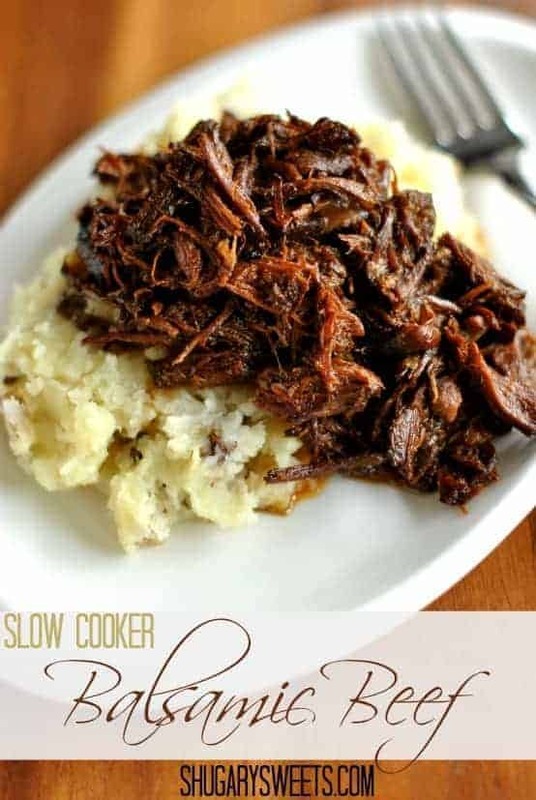 I love having a new go to slow cooker recipe, our lives just keeping getting crazier too! Thanks Aimee! Gorgeous picture by the way! This sounds absolutely delicious! I love anything with balsamic : ) I really need to use my slow-cooker more often … I only use it every once in a while on the weekends.. I would love to have a big batch of leftovers from this to eat throughout the week! Wow! That looks delicious! My husband would love this with the balsamic vinegar. The mashed potatoes look fabulous too! We love a good smashed potato (just add cream, butter, and garlic salt)!! Has anyone tried it sans sugar?? I would love to know how this would turn out without the brown sugar. I’m diabetic and watch my carbs very closely, so omitting the sugar would make this the perfect meal. However, I don’t think I’m willing to risk 5 pounds of meat without hearing how others have faired. I made this yesterday and it is DELICIOUS! My husband and I loved it. Thank you for sharing! So glad you enjoyed the recipe Julie!!! Oh my gosh I heart anything with balsamic in it. I HAVE to try this with my next roast!!! This seriously looks so amazing! I LOVE balsamic anything! (well, almost anything) 😉 Great recipe! I love anything in the slow cooker! This meat looks amazing! Wow, I think we were separated at birth! I’ve often joked if it wasn’t for the slow cooker we’d have starved years ago. Kids now 7 & 4 and still using it. Had to replace it last year, it was a wedding present also! Nearly had a conniption fit when it broke down. It took just 24 hours to source & replace! 🙂 Will deffo try this recipe thanks for sharing! Haha!!! Enjoy the recipe Martina! Thank you for a wonderful recipe. I made this yesterday and it was a hit! We are enjoying the leftovers. I’m going to have to start with a larger roast next time so i have extras for freezing. Can it be frozen or does it need to be thawed? I usually use a thawed roast, so that the flavors don’t get diluted with the juices as much. However, if you add some time on to your cooking time, you certainly could use a frozen roast. You may also want to add extra seasonings… ENJOY. I normally dont leave comments but I made this today for dinner and it was AMAZING. I made it and put it over noodles. Your brain thinks your going to bite into a beef tip and gravy then your taste buds are like woot woot back the truck up…whats this sweet goodness you gave us. Thanks for sharing. This looks really amazing! I think my family would love it. Pinned! 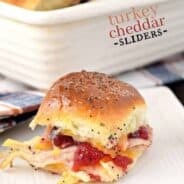 I am looking for a recipe to use for hot sandwiches. Do you think this would be good for a hot beef sandwich or do you think the flavor is to bold for sandwiches and is better with potatoes? Hmmm, I’m not sure how it would be with the veggies in there! You could try?! Hello, just wondering if we could use pressure cooker for this? if so, how long do you think it will take. Will appreciate for you answer. Cheers, thank you. I’ve never used a pressure cooker so I have absolutely no idea. So sorry!! So glad you enjoyed your dinner Debbie! A little red pepper sounds perfect to me too!!! We have the balsamic beef in the crock pot now…it smells divine!!!! Can’t wait till it’s done cooking. A bottom round would be great! I made the Balsamic Beef tonight! OUTTA SITE!! It came out great. M first Pinterest recipe I’ve made! Thanks so much for sharing it! Hmmm….I don’t think 3 hours is nearly enough time to cook even a small roast. Try to do 6 hrs on low. I’ve made many crock pot roasts, and never had a problem but I’ve always let mine go all day while I’m at work. Gonna try this one this weekend! No, I would say regardless of the size of roast, you want to cook it 6 hours minimum. Better off longer to get that nice shred!! Enjoy. I had a 3.5lb round roast and I still did almost 7 hrs. It was moist and tender but definitely couldn’t have shredded it with a fork. It was the first time for me too doing a full roast and don’t know if I it was the cut or if I just have a super slow slow cooker. Also, is the gravy more like a jus? I assumed I would have a thicker sauce consistency but it was jus-like thin. It is more like an au jus. It could have been your cut of meat for sure, but 7 hours it should have shredded! not sure what to tell you! Making this tomorrow. I am using a deer roast instead of a beef roast. Can’t wait to try it though. Sounds delicious. Enjoy the recipe, let me know what you think!! I am not a big deer fan but this was awesome. I didn’t have red pepper flakes so I used jalapeño flakes. Both kids had seconds and thirds. Thank you for the recipe. It’s definitely a keeper. Made this last night and it was amazing! I used a 2lb chuck roast (for 2 of us) and had plenty of leftovers too. The flavors were sensational. Thanks for a great go to recipe! This looks incredible. I have to make it this week. Putting chuck roast on the grocery list!! Made this tonight and it was awesome!!! I had no leftovers it was that good!! Made this for Sunday dinner! Oh my goodness! It was amazing! I didn’t have any beef broth so I used a packet of brown gravy. The smell of the vinegar in the beginning was a bit strong but after simmering all day, the house smelled amazing! My 21 yo son had thirds and ate the meager left-overs the next day for lunch! Thank you so much for a new recipe in my rotation! I have made this dish several times now and it’s always amazing!! I have made it with pork tenderloin instead of beef on several occasions and we love it more that way! So good and tender. I use the excess juices to make gravy and it’s so delicious! Thanks for a great recipe!! What a yummy twist on roast! We enjoyed this recipe, and I linked to it on my blog to share with others. Thanks for sharing it! So glad to hear you enjoyed the dinner recipe! This looks and sounds so good. It’s on my “to do” list. What’s the potato dish that you served with it? The one in the main pic? It all looks so yummy! That’s just some homemade smashed potatoes! Made this tonight and OH MY GOSH, is it good! Thank you! I made this the other night with venison instead of beef and it was delicious! 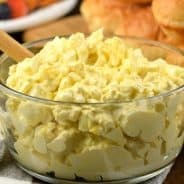 I am doing a round-up of our favorite freezer-to-crock pot recipes, and I was wondering if I could include an image from this recipe in my blog post. (Linking back to this recipe, of course!) Thank you! My gluten free husband hasn’t had a roast in a year since his diagnosis…I switched the soy to gluten free soy sauce and otherwise followed the recipe exactly. He just saod this is the best roast he’s ever had in his entire life. THANK YOU! I made the shredded beef tonight, it was fabulous! My wife is on a highly restricted sodium diet. that means the soy sauce and kosher salt is ‘out’. 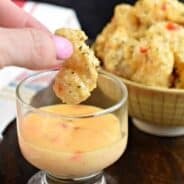 How critical are they to this recipe? What could i substitute in their place… anything? This looks so good i’d love to make it! Thanks for your thoughts. This has quickly become one of our family’s favorites – thanks so much for sharing! Thank you Melanie, glad you enjoy the recipe! I made this tonight with sautéed kale and garlic mashed potatoes. Absolutely delicious! My husband is super picky and he loved it. Thanks for the awesome recipe! This was delish! I first served it with some mushrooms & mashed potatoes. The next day, I cooked some with the leftover need broth, kale & wheat pasta. I wish the sauce was a touch thicker but it was so good both ways! Thanks! Made this last night for my book club. Served it on mashed potatoes, with roasted green beans on the side. And enough leftovers for Sunday meal with my husband. It was great! Awesome!! Sounds like the perfect side dishes too. I made this tonight it smelled so good all day. It was really tasty too. I did sear my roast first with some dehydrated garlic, fresh pepper, and a little salt in olive oil than I didnt have beef stock so I subbed some chicken stock in the marinade and had a little left so I deglazed the pan with that and poured it over the roast in the crock pot. I made mashed potatoes to go with it. I also mixed a little cornstarch with cold water and added that to the au jus and boiled it till it was a nice gravy and it was perfect. I have quite a bit left over so im thinking they might be good in chimichangas tomorrow………..
Aarrgghhh…I made this today and my beef was tough, not shreddable 🙁 I had it on low for 5 hours and it was 4 lbs..help!!!! The recipe is for 6-8 hours for a 4-5lb roast. That extra hour (to two hours) really makes a difference!! Thanks! I was nervous…let’s see what a few more hours does! THX again! Planning on making this for dinner soon, but have London Broil on hand instead of chuck roast. Would it still work? Would the cooking time be any different? Thank you!! Thanks so much for this recipe! It has become a favorite in my house very quickly. I tried this recipe out last night and was pleasantly surprised. There was still an hour left on the crockpot when I got home and waited until my 8 hours were up to shred the beef with a fork. The meat was so tender and juicy. I served my balsamic beef with mashed potatoes, green beans and carrots. Thanks so much for this recipe. It’s a winner in our home. what other type of beef cut could you use? I am so hopeful that this recipe will rock that I have already invited 5 people over for dinner to enjoy it…Thanks for sharing! made this and put it over spaghetti squash..oh my! This has now moved to the top of my long list of slow cooker recipes! Thanks so much for sharing! Hi! I’m new to the slow cooker world and just wondered about doing a smaller version of this? I have a little 2 quart slow cooker (just for the two of us), so I would have to do a smaller roast. Should I half the entire recipe then? And would it still cook for 6 hours? Recipe sounds so wonderful I really want to try it out! I’ve had this pinned forever and am finally making it tonight. I’m a professional organizer and I tell people that the slow cooker is their best friend. Looking forward to it! Made this for Super Bowl Sunday and DANG!…it’s a Keeper. We rate 5 out of 5. Super easy too. I ended up with a 3.5 lb roast but made the full recipe for the sauce. I also seared the roast before putting into the crock pot and strained the sauce afterwards. Absolutely delicious. Thank you for sharing!! I was trying to figure something interesting to do with this roast my Partner took out of the freezer 2 days ago so I went to Pinterest and found your recipe. I’m doing it in the pressure cooker for 25 minutes with plans to shred it then brown it a bit under the broiler something like you would do with carnitas then either serve it over rice or in a hard roll as you would do pulled pork. It smells incredible in the kitchen as I’m posting this. I hope my partner likes this. I’m the guy who does the interesting foods and he’s the one who does the stir frys. Thanks for this great idea. Let me know how it worked out. I’ve never tried it in the pressure cooker! I made this in the pressure cooker yesterday AM and wound up adding 10 minutes to the pressure cooker. It turned out Really good but I’m going to do the crockpot next time as I think the flavors will be more intense. I shredded it then added a thinly sliced onion to it then spread it out on a jelly roll pan and put it under the broiler for ten minutes. I took the juice and strained off the fat added another 1/4 cup balsamic and 1/2 stick of butter and reduced it to about a half cup. I drizzled the sauce over both sides of hard rolls and added the meat. As a side I roasted asparagus with olive oil and kosher salt and served that with the sauce drizzled over it. The sauce is OUTSTANDING over the asparagus. THANK YOU for such a great recipe!!! This turned out tender and delicious!! Thank you for Sharing. Served with mashed potatoes. One of my favorites 🙂 Thanks for letting me know!! Hi – I have some stewing beef cubes in the freezer. I was wondering if I could use that instead of a whole roast for this recipe? Also, I’m assuming the substitution would affect the cooking time? It looks delicious! Thank-you! I’ve made this twice in the last month. It’s amazing!!!! Do glad I found it on Pinterest! I am searching such kind of post which provides a delicious recipe.I must try this at home to impress my husband. I love to make this dish in my Slow Cooker and it was awesome and a must share! Thanx for the recipes.